The hire of building tools is not very common here in Portugal. So you may be tempted to look around for a cheap alternative to rental. I know that money is always tight and the Chinese shops sell all kinds of tools at very low prices. Also the shops are always open so if you forget that you need a tool the Chinese store is an easy place to shop. Why do I have this negativity about Chinese tools. That is easy to answer. In the past I have bought tile drills that would not drill wall tiles, not even one. I have bought metal tape measures which had edges so sharp and ragged that when they retracted it was like holding a razor blade between your fingers. The resulting cuts poured with blood and were hard to stop bleeding when you were working. If you want proof of typical poor quality Chinese tools. Take this 10 mm SDS masonry drill. I didn’t know that it was Chinese and used it to drill 20 small holes in cement block. 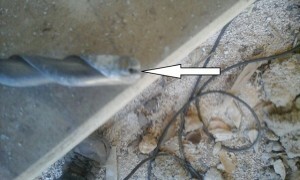 After drilling what seemed like a very tough block I pulled out the drill and found that the carbide tip was not there. It had just fallen off ! 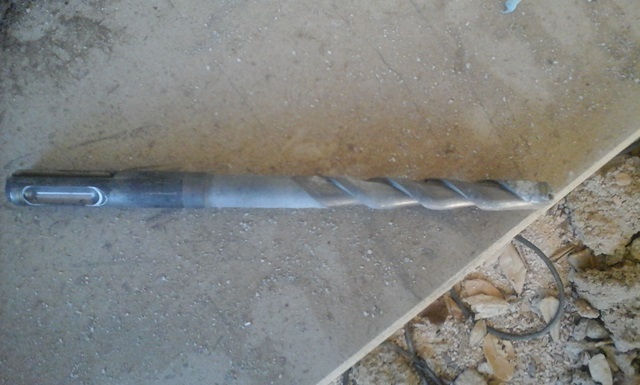 making the drill bit useless. Also a colleague using a Chinese hammer drill for three days had to stop using it because the hammer action had stopped. Three days work and in for repair or the bin! My Bosch drill on the other hand drilled holes faster and continuously. The above proves to me that these Chinese building tools are very poorly made and I believe that they are bordering on counterfeit rubbish. They are definitely not value for money, cost effective or a bargain and are a waste of your money. There is another worry that I have with poor quality Chinese tools and that is the possibility of something dangerous happening if they break while you are using them on site or on your home renovation. You are probably better off borrowing better quality tools from a friend or letting a professional take care of it. Here are my building tools top tips. Tools Top Tip 1, Buy a very good quality and long extension lead. One with rubber plug and a winding/carrying spool. Tools Top Tip 2, Only buy “household name” tools which can be repaired in Portugal. Tools Top Tip 3, Don’t buy “professional quality” high end tools such as Sthil as you will not get anywhere near half your money back when you sell them. Tools Top Tip 4, Do not under any circumstances lend your tools out. Especially to local builders even if they are working on your property. It is very common to have them returned broken and you will be left with the repair bill. Tools Top Tip 5, Do not bring to Portugal DIY tower scaffolding especially if you are intending to erect it on public paths or spaces. The laws are changing and you could be fined if your scaffolding does not comply and also if you dont have a license.